What do you do with three kids who all still have fevers? 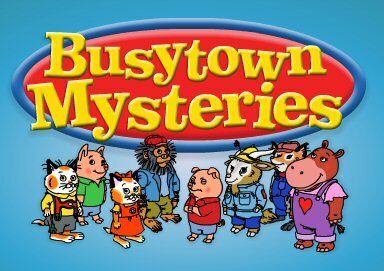 Answer: A marathon of the new-to-us cartoon Busytown Mysteries. (God bless the creators of Netflix Watch-it-now.) The kids loved this show; even Bean would sit and watch parts of it. I enjoyed it too, since I read plenty of Richard Scarry as a kid. Curly had to go downstairs and find the dilapidated homemade "Lowly Worm" that lives in our stuffed animal bin. Poor Lowly used to be carried around by the neck until his head nearly fell off when I was about three. About halfway through the day, around episode ten or so, Curly discovered that she could correctly guess the plot of each episode. For the rest of the day, she and Mister held earnest conclave about what they guessed to be the plot, and if they were right, they laughed like hyenas, congratulating one another and telling me in detail all about it, although I sat there through the whole thing watching it with them. I'm glad to see a kids' cartoon that I actually enjoyed too, and it didn't have any hidden political agendas. As a bonus, all of the cute cars around the town kept me and the kids playing a constant game of Where's Waldo as we looked for the carrot car, the doughnut car, etc. I'm also pleased to discover that Lowly Worm is still my favorite character. He wears red Converse on his one foot. You gotta admit, the guy's got class.